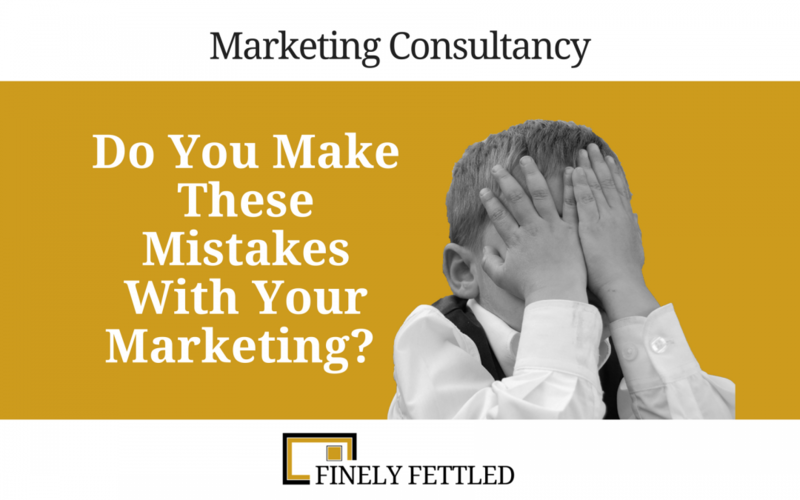 These 2 Marketing Mistakes Could Be Costing You a Fortune! The marketer in you should see mistakes as something you have done to learn from. Something you have confused with a good idea, but it’s really not a good idea at all. Maybe you took advice from others in your industry or from others you have seen advertise. #1 Is your logo getting too much space in the wrong place? The reason I believe this marketing mistake is made, is because people equate their logo with the message and their desire to ‘get their name out there’. What happens is your logo becomes front and central to your advertisement. It takes up valuable space on the critical ‘real estate’ of websites, the first 6 inches from the top. You know, that’s the area where the three important questions need to be answered. Why should I choose your company versus every alternative out there? Here a logo can help that spilt second reconnaissance that a visitor is looking for just as they arrive at your site, so they can answer the question ‘Where am I?’. On websites, typically the logo is top left or centred. The size of the logo can be small, leaving you plenty of space that you can dedicate to marketing mistake #2 Your headline. In print advertising, so many small businesses devote an extra ordinarily large amount of space to their logo. I’m looking at a scaffolding company that has chosen to devote 45% of the total space to their name and logo. The question to ask, is is their logo and names such a strong local brand that it compels attention? Is their business name the most important thing that can be said about it? Or would the scaffolder attract more attention by tuning into the conversation already going on in the mind of the reader, that their scaffolding was the best answer to a problem the reader faced? If your logo is NOT the most interesting or persuasive thing that can be said to a potential consumer, then tuck it away, and in print ads and postcards, your logo belongs at the bottom, not at the start. Still looking at the local print ads containing the scaffolding company, I note only 1 from 4 ads contained a headline. Another marketing mistake. There is almost never a justification for running an ad without a headline. Can you think of an irresistible piece of information in scaffolding? How quick the scaffolding goes up, safely. How your building project is more profitable because they complete quicker than their competitors. Could they guarantee a set up and break down time? “We Guarantee To Beat Any Genuine Quotations” – really? That the best they can do? To offer cheapest? When you look at their site, they offer “a multitude of solutions”. Maybe they have MORE solutions than any other scaffolder. Have they completed thousands of jobs? Have they a perfect safety record? The scope for positioning their company is huge, but they tiresomely offer cheapest. “One of Yorkshire’s premier scaffolding companies – proudly serving the north of England” – the inclusion of ‘one of’ steals the exclusivity, it steals the limelight and fails to underpin their actual credentials. Their headline should feature alarm, news or a compelling promise of benefit. It doesn’t do any, does it? “Scaffolding Services Wakefield & West Yorkshire” – This business had a better sub-headline further down the website, which draws on WHAT a buyer wants from scaffolding. My advice to them is lift this right into POLE position. If your headline doesn’t stand out, you will lose visitors in droves, they’ll get lost in all the online noise screaming for their attention. The next in line from my Google search, simply had an image of Manchester Victoria Station. I was left with the feeling “so what?”. Then Get The Fastest Complaint Scaffolding Turnaround in West Yorkshire, Guaranteed. Do You Make These Mistakes When You Commission Scaffolding Projects? Who Else Wants To Complete Their Scaffolding Project On-Time and Under-budget, Guaranteed? You can choose to consign the simple marketing mistakes in your advertising to the “been there, done that, moved on” bin. Get some help today by asking marketing consultant, Graham Arrowsmith at Finely Fettled to work with you on your marketing first footing. Call Graham on 01535 654930.